What are merchant MCC codes? What are merchant MCC codes? What’s my MCC code? 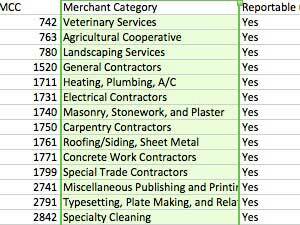 A merchant category code or MCC code is a four digit number assigned to classify a business when accepting credit cards, to determine whether payments are reportable to the IRS, and they also impact merchant fees. The MCC code determines which interchange rates a business qualifies for. For example, only certain MCC codes can qualify for level III processing, which offers lower fees for corporate, business and purchasing cards, and the same applies to non-profits. Merchants can be incorrectly classified and never know it, until someone recognizes that specific interchange rates are missing from a merchant statement and then investigates to learn why. This entry was posted in government news and tagged credit card processing by Christine Speedy. Bookmark the permalink.